It isn't often that a respected long-time member of a band to start looking for side-projects. It's not often that they release albums by two projects in one year in different genres. 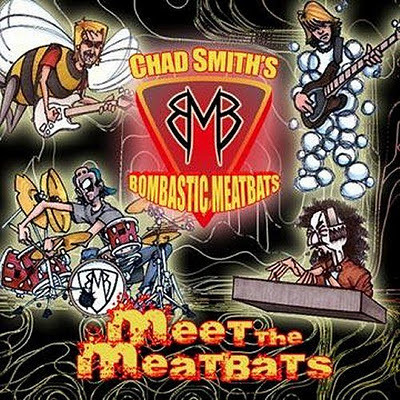 One such project, Chad Smith's Bombastic Meatbats, which takes the Red Hot Chili Pepper into the area of jazz. Can a funk drummer make a smooth transition into the technical genre? If there was a song to lead this set with, it could only be "Need Strange" as it is almost a frenzy of Schroder playing the Peanuts theme and the theme from Sanford and Son. Each instrument has a showcase and there is something more than fusion jazz here. There are many other highlights including the musical journey of "The Battle For Ventura Blvd." with enunciations, lulls and tensions that take you for the ride. "Oh! I Spilled My Beer" touches on some rock guitar in some flourishes but is dominated by a keyboard groove that can be inebriating. "Death Match" starts with a little posturing and a struggle develops midway with a triumphant conclusion. All starts casually with "Night Sweats" with a few nightmarish moments, some relief, tossing and turning and the rhythmic beat of your heart as you awake. Great to see the Latin-feel of "Lola" amongst the set adding to a very diverse album. Is Meet The Meatbats a casual album for any Red Hot Chili Pepper fan? No. This is what I would put in your hands if you told me you wanted to stretch your musical palate.